Hearing of a loss can be tough. 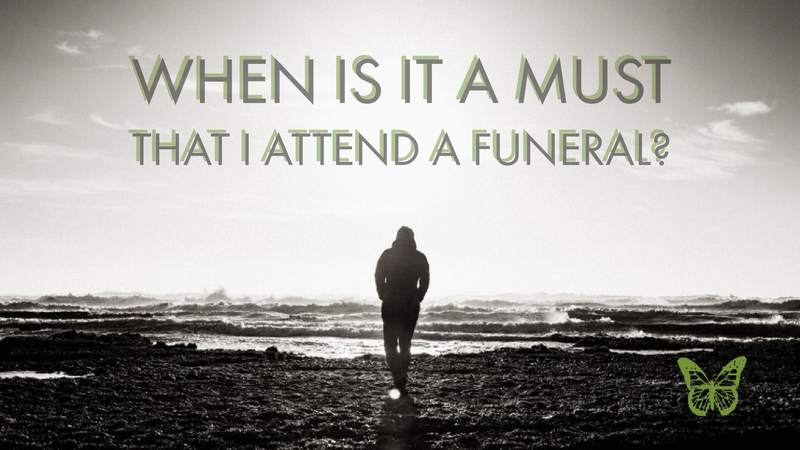 Sometimes, you immediately begin preparations to attend the funeral or memorial service, but at other times, you hesitate. What are the rules and am I expected to attend? Will I be out of place if I do, or will I be sorry if I don’t? Always trust your judgment. If you feel you have to go or simply can’t, then follow your heart. But if you have any doubts, here are a few guidelines to help you sort it all out. FAMILY relationships are the hardest to contend with since many families are fragmented over time. Some have been changed by distance when one family member relocates. Others are stressed by family dynamics. When there is a loss, people must make decisions. If the distance is manageable, then you should attend. Closure is very important, and our social norms are based on the traditions of generations and their ways of saying goodbye. Even if you are not comfortable attending the service, you should pay respects at the visitation with family. FRIENDS are often closer than family. While it may sound strange, we choose our friends based on common interests, so we develop a special relationship. When we say goodbye to a friend, we must attend the visitation and services. THOSE WITH AN IMPACT ON YOUR LIFE may come from social circles such as church, school, clubs, organizations, unions, or political groups. These people may be acquaintances or friends, and they may or may not be close in the same ways as the other people in your circle. Only you can decide where you stand based on your comfort level. While you were totally at ease with them, you may not be with their whole family, and this will have a part in your decision. However, if the one who passed had a profound impact on your life, then you should go and say goodbye. BUSINESS ASSOCIATES are difficult to assess. If you were friends as well, or had a close working relationship, then go. If you simply spoke in the hallway, you are not required to do so. Companies can be quite large, and you may not have any reason to associate with someone other than work. You can send a card or some flowers and rest assured that it will suffice. However, if the person was a leader in the organization, you may want to attend the visitation and pay your respects, but are not required to attend the funeral. Sending a floral arrangement or memorial contribution is always acceptable. If you can’t attend or simply aren’t comfortable doing so, then sending flowers will let their relatives know that you thought of them. Family and close friends should be remembered with a larger spray, while associates and work relationships may be commemorated with a bouquet or planter. Saying goodbye isn’t easy and many times, personal relationships are hard to navigate. Closure is important for all, and if attending the funeral will help, then make arrangements to attend and say your goodbyes. Ascension Funeral Group serves the Mobile, Alabama area with funeral and cremation services, grief support, pre-planning, and more. Visit us online at www.AscensionFuneralGroup.com! Call us anytime at 251-634-8055 or connect with Ascension Funerals & Cremations and Forest Lawn Funeral Home on Facebook and Twitter.